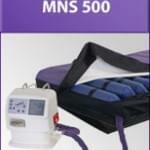 The MNS 500 Low Air Loss System is designed for long term care and home settings. Its alternating pressure relief system or Genuine Low Air Loss system gently massages the epidermis while continually changing contact points with the skin's surface helping to eliminate the development of and provide easy and effective treatment for pressure ulcers. The 80" x 35" (U.S.) and 76" x 35" (Eu.) mattress is constructed with eight inches of cell flotation, has multiple cycle settings ranging from five, ten or fifteen minutes, is easy to maintain and keep clean, has twenty individual nylon and TPU air cells for multiple low pressure zones and comes equipped with a CPR valve for quick emergency air release and three pump options for quick filling. The Genadyne's Low Air Loss System is a portable low air loss therapy mattress system that provides the therapeutic benefit of pressure relief and skin moisture management. It also has the benefit of the Derma Pulse feature for "Pain Management". The mattresses are constructed with eight inches of cell flotation and have a lower safety mattress for patient transfer of power failure. Detta inlägg skrevs av MNS 500 Alternating Pressure Relief System och har visats 2715 gånger.